Near the beginning of the film Hugo, there progresses an elongated tracking shot that follows the title character, a young orphaned boy of eleven, as he rushes urgently through the tunnels and up the ladders and staircases that form the inner walls of a Parisian train station. 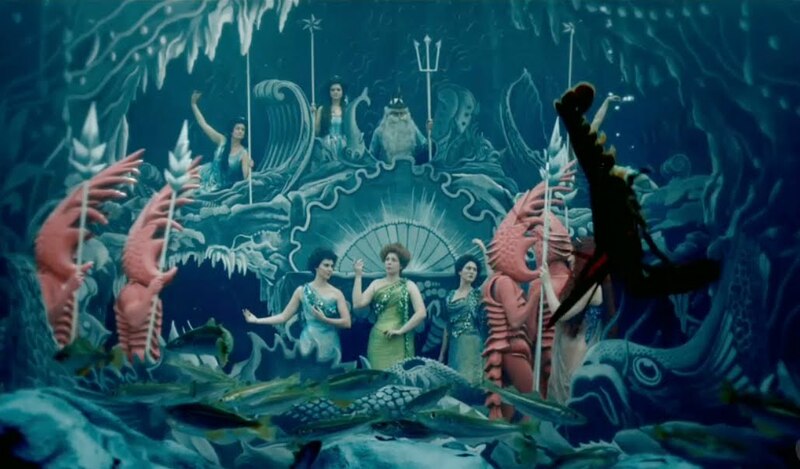 While the marvelous sequence reminded me of director Martin Scorsese’s other films, it also reminded me of a famous and influential essay by scholar Tom Gunning called “The Cinema of Attractions.” In “The Cinema of Attractions,” Gunning postulated that the appeal of the earliest films was based not on narrative, but on the immersive experience that only the cinema could offer. This early, spellbinding shot in Hugo (all the more so with 3D), a film in which the narrative encourages us to remember some of the earliest achievements of the cinema, indeed had as much that same effect on me as the earliest cinema has on its audience, drawing me deeply into the film before its story could even begin. As I sat gazing up at the screen for much of the next two hours, allowing the visuals and narrative both sweep over me, I never felt anything less than fully immersed in what was happening before me, a rare occurrence these days, where even my most rewarding film-going experiences involve some form of conscious disconnection. As Martin Scorsese’s Hugo emphasizes throughout its story, films can sometimes be our dreams made real; this film itself is a testament to that, a true masterwork from one of cinema’s true living masters. Hugo, adapted by John Logan from Brian Selznick’s Caldecott Award-winning novel The Invention of Hugo Cabret, tells a story of deep loss and redemption set almost entirely in a vibrantly magical recreation of the Montparnasse Train Station in Paris around 1930. Young Hugo Cabret (Asa Butterfield) lives a hard-scrabble existence living in the outer walls of the station. Once upon a time, Hugo lived alone with his loving father, a horologist (Jude Law), who once brought an obscure, mechanized automaton – a mechanical man who writes with a pen and paper – home from the his job at a museum. Hugo and his father spent their free time working on the machine, but before they could finish, the father tragically died when the museum burned down. Hugo, in true Dickensian fashion, then goes to live with his drunken uncle (Ray Winstone), who tends the clocks at Montparnasse. One day, however, the uncle also vanishes, never to return, leaving Hugo to tend the clocks on his own. This he must do without fail, or else Hugo will attract the unwanted attention of the station’s Gendarme (Sacha Baron Cohen), a World War I veteran who patrols the station with a large dog and takes sadistic glee in sending unwanted children to the orphanage. Meanwhile, Hugo steals food from the station café to survive, takes parts from the toy store so he can repair the automaton and finish his father’s work, and watches from the clocks around the station, alone, as the world goes by without him. 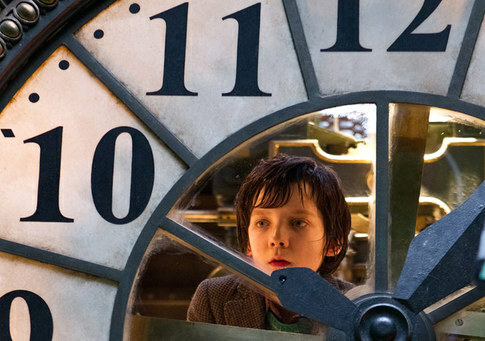 Hugo (Asa Butterworth) peers out through the clocks in Montparnasse Station. One day, as Hugo attempts to steal from the toy store, the proprietor, an old man names Georges (Ben Kingsley) catches him and takes his notebook, which contains all of M. Cabret’s notes on the automaton. Desperate to get it back, Hugo pursues the old man and befriends his god daughter Isabelle (Chloe Grace Moretz) in his attempts to get it back. Before long, both the Old Man and the Boy come to recognize in each other a shared sense of melancholia and loss, and the toyseller further sees that Hugo possesses considerable knowledge and talent when it comes to mechanical devices. Papa Georges, as Isabelle calls him, eventually agrees to return the notebook if Hugo works off his debt in his toy shop. Hugo and Isabelle, meanwhile, become close friends, and when Hugo discovers that Isabelle has the missing key to his automaton, it starts them on a journey of discovery that soon reveals that “Papa Georges” is actually none other than the great Georges Méliès. Hugo and Isabelle (Chloe Grace Moretz) and M. Cabret's automaton. Méliès, for those unaware, was one of the pioneers of the cinema, an astonishingly prolific filmmaker who, in most respects, invented film special effects and very certainly created the film fantasy and science fiction genres. 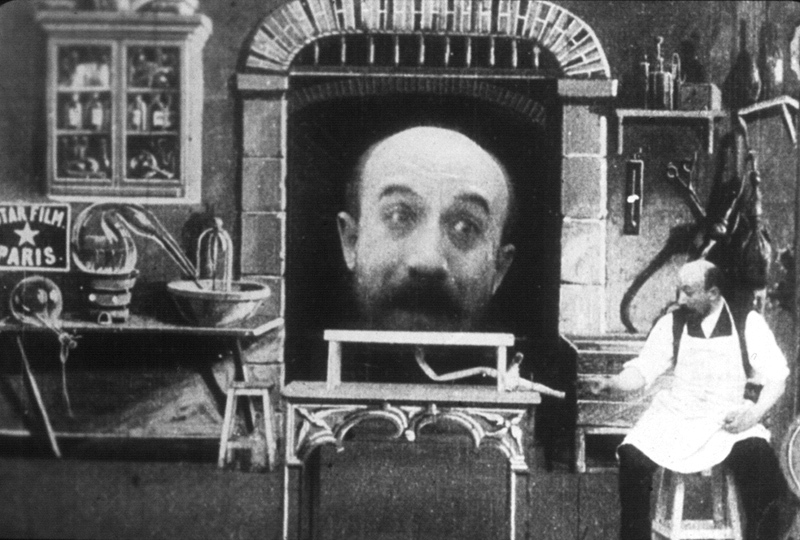 Méliès owned his own studio, and directed, starred, set designed, costumed, edited, and invented many of the “trick” effects he used in his over 400 films (most of which no longer exist). Unfortunately, after years of seeing others, including Thomas Edison, outright steal or recreate his work without compensation, and with the coming of the First World War, Méliès’s film company went out of business. To keep his head above water, he sold his films to chemical companies so that they could be rendered to produce the rubber soles of shoes, and he eventually fell into complete obscurity – heartbroken, penniless, and fully expecting to spend the remainder of his days in his little toy shop in Montparnasse (which was actually true). The film ultimately tells a story of redemption for both Hugo and Méliès, both of whom have lost their place in the world, and need each other to find it again. Hugo and "Papa Georges" (Ben Kingsley) at the old man's Montparnasse toy store. Hugo taking Isabelle to her very first film. 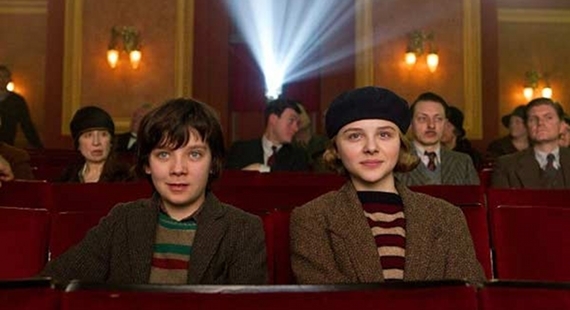 As a film, "Hugo" is a loving ode and allegory to the art of cinema, film preservation, and the importance of cultural memory. Of course, the story of Hugo itself is a loving ode and allegory to the art of cinema, film preservation, and the general importance of cultural memory. In the film, Hugo’s personal need to finish his automaton as a way of maintaining his connection to his dead father feeds his further need to repair things in general. The automaton, of course, as a construction of both artistic beauty and finite craftsmanship, is commiserate with the cinema itself, and Hugo’s quest to repair the machine and heal Méliès and his legacy, represents the process and need of restoring and preserving the films that form cinema’s vaunted history. Both the aspect of clock building and the Montparnasse Station each represent the same central metaphor that Scorsese uses for the art of cinema itself, that appreciating film always includes recognizing a metaphysical experience of the heart, mind, and senses, while simultaneously understanding the craftsmanship, patience, effort, and genius that goes into any great cinematic work. One of the film's beautiful recreations of how Melies created his work. There, of course, is a great deal of Scorsese in Méliès and Hugo both. Méliès, in many respects, can be seen as Scorsese in the modern day, an older filmmaker raising a young girl (Scorsese has a nine-year old daughter) looking back on his lifetime of works and concerned about making sure his legacy is intact. Hugo’s own life, trapped inside the walls of Montparnasse and gazing out through those magnificent clocks at the world going on around him, whether they are the small stories happening within the station or the wide expanse of Paris moving past his eyes, mirror the well-known experiences of Scorsese’s own childhood. Back then, the young cineaste, beset by severe asthma, often had to watch life in his New York City neighborhood from his apartment window, with his few social activities being mostly limited to trips to the cinema. And like Hugo’s efforts with Méliès, Scorsese’s efforts towards film preservation and promoting film history have helped restore prestige to many forgotten giants of cinema’s past, including the great Michael Powell and the blacklisted Abraham Polonsky, and have saved countless potentially lost films from the dustbin of memory and neglect. The actual George Méliès (center) in one of his many "trick" films. I must admit, my perspective on the film may be somewhat different from others, entirely due to my own scholarship and my own life experiences with movies. Hugo, both film and character, make the assertion that films are “dreams we experience in the middle of the day,” or simply put, our dreams brought to life. It’s certainly a nice, warm, reassuring fantasy, but the fact is, films can also be lies and illusions. Those illusions can, and should, be appreciated as art, but I also think it’s healthy to see them for what they almost always are, which are cultural products designed for consumption; which, with a $150 million price tag, Hugo most certainly is. With that said, I can forgive Hugo for that exclusion; this is, after all, marketed as a family film, and I did not for a second doubt the earnestness of Scorsese’s love of and commitment to his subject. I also feel the need to state, that while Hugo moved me greatly, it wasn’t always in a good way. There were moments in this film, especially in its depictions of Méliès tragic past, that somewhat mirrored my own failed dreams; there was even one scene that could have been from my own life, when Méliès, after having closed his studio, burns many of his amazing sets and costumes. I’m no Méliès, and I never will be, but as someone who once did the same to a large pile of his screenplays that no one ever wanted to read, it tapped within me a reservoir of vast grief. 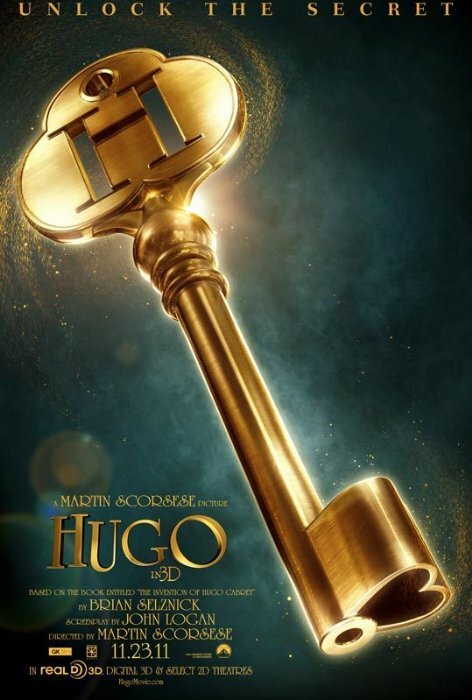 Therefore, as someone with a history of broken dreams, Hugo was sometimes for more devastating for me than cathartic. Again, though, that’s not the film’s fault, it’s my own. I mention it, though, to emphasize that this is a tremendously moving film about very deep psychic issues, and though I think the majority of folks will find it to be honestly cathartic, if you’re like me, you may find it as much like reliving a painful memory as experiencing an amazing dream. Of course, if dreams and lies share something in common, it’s that, in the right context, they can be wonderful, and the same is definitely true of a film like Hugo, which I would dare call Scorsese’s best film since The Age of Innocence. In a fitting testament of the true marriage of his peerless dedication to his craft and the artistic culmination of his lifetime of devotion to cinema history, Scorsese has made a film that is not only seen, but experienced, just as movies, from their earliest days, were always intended to be. Posted on November 28, 2011, in The Antiscribe Appraisals (Reviews) and tagged 3D, hugo, kingsley, melies, scorsese. Bookmark the permalink. Leave a comment.